I was all set on the N97 until a three way ruckus broke out with the Omnia HD and Idou both diving in to join the Super-Mobile-Convergence-Device war. The code-named Idou, bringing in 3.5” widescreen display, as well as Symbian S60 V 5.0 and a 12MP camera with Xenon. They all run on Symbian S60 V 5.0; even with their own specific interface ‘quirks’, they should all be pretty similar to each other. We’ll just have to see when they’re all at production level to see who makes the most to bring the best user friendly and innovative interface. Is the 32GB of memory and physical keyboard enough to keep you from straying to the Samsung or Sony-Ericsson camp? We’ve seen most of the wow features on the N97 along while ago from the aged classic that is the N95 announced in 2006! On-board GPS, A2DP, 3G, HSDPA, WiFi, 5MP Carl Zeiss camera with LED flash, 3.5mm audio/tv out jack (most of which the mass public easily overlooked). Whilst the N95 was ahead of its time for quite a while the N97 which hasn’t even hit the shops is already flanked by two other very powerful rivals. 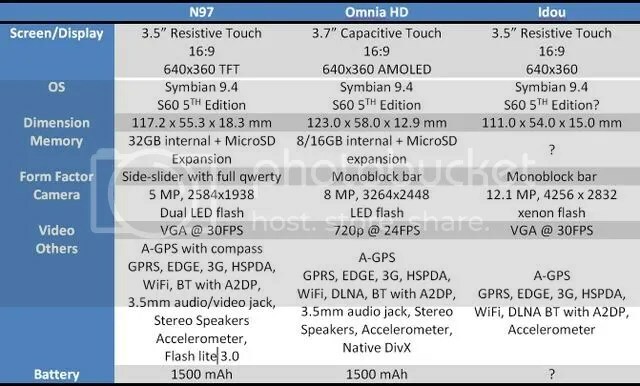 It seems it won’t be long until the hardware battle becomes saturated, all phones being more or less identical in shape, size and features where everything will come down to who’s providing the best software, online services and community/ecosystem interaction. So, in this combat of flagships, do any pack enough artillery to sink the infamous iPhone? Or will that be accomplished by the elusive Palm Pré, or perhaps an Android?